Around Australia, each state Department of Transport or equivalent conducts regular household activity and travel surveys. These are massive affairs surveying thousands of households to understand their travel behaviour. In part the huge amounts of data are needed to calibrate the equally massive strategic transport models that (more or less) predict future travel demands. Not long ago I downloaded a batch of their Sydney data and whacked it into Excel to see what I could do with it. 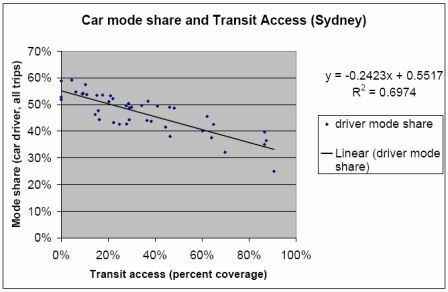 One of the first things I did with it was to take the figure which showed the average mode share for car driver by LGA (1997-2001 average) and did a simple linear regression against the 1996 ‘transit access’ figures that I had previously calculated for my thesis in 2005. Transit Access (a percentage) is defined as the proportion of an area that is within 800m of a train station or 400m of a bus route that runs at least every 15 minutes during the day and at least every 30 minute at night and on Sundays. (I had previously developed this measure and found that it was about the minimum public transport level needed to generate a reduction in private vehicle VKT). This time I was more interested in overall number of car trips, because this can be very important in understanding traffic impacts (and hence infrastructure requirements) of a urban development. Each 1 percentage point coverage in full time public transport generates a 0.25 percentage point drop in car driver use. You are currently browsing the archives for the mode share	category. On the Broad Gauge is powered by	WordPress 4.1.26 and delivered to you in 0.410 seconds using 30 queries.